ALIVE & WELL | Pro Chem, Inc. ALIVE & WELL is a multipurpose product with a fresh scent. Using it eliminates the need for several different products that each have different fragrances. Safe on all surfaces that are unaffected by water. 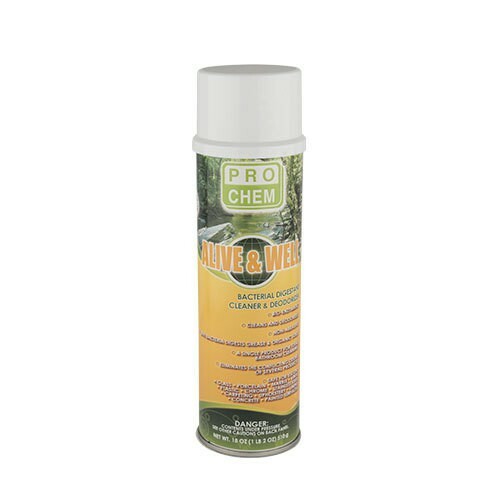 It is a chemical blend of biodegradable cleaners and enzyme-producing bacteria which work together to safely dissolve and digest organic deposits that can cause odors. It pleasantly deodorizes as the natural biological action destroys organic waste without the use of acids or caustics. Concentrated aerosol foam is safe and easy to use. Quickly removes mold and mildew from any water-safe surface. Functions on contact to clean and deodorize, then extends cleaning time as the active bacteria multiply to reduce organic matter, grease and food byproducts. Spray on and let stand for 10 seconds. Agitate with a brush or sponge. For heavily soiled areas: Reapply ALIVE & WELL, keeping area moist and undisturbed for 4 to 6 hours, then wipe with a damp cloth.